Will Scupham scored a decisive late try to earn Boston Rugby Club revenge for their early-season loss to Chesterfield Panthers. 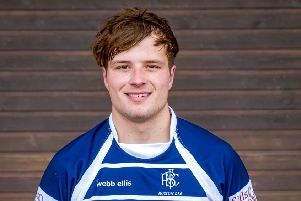 Seven days earlier the same player kicked the late conversion as the Blue and Whites beat Southwell, and Scupham was at it again at the Boardsides on Saturday. Despite Boston starting brightly and putting pressure on the visitors, Chesterfield’s defence was more than up to the task and it soon became evident that scoring opportunities would be rare. Boston had an opportunity to take the lead in the eighth minute, but a penalty attempt by Scupham drifted wide. However, the hosts did enter the interval 5-0 in front. A quickly-taken tap penalty in Chesterfield’s 22 saw the ball transferred down the backs for substitute Tom Brooks to squeeze into the corner to put Boston in front. After the interval, Chesterfield upped their tempo and it was Boston’s turn to put in a defensive shift as the hits became bigger and more frequent, with Joe Deamer leading by example. With six minutes to go Boston moved 12-0 in front, a score that was to have a vital outcome on the result. Another tap-penalty, this time 10 metres from the line, saw Scupham produce a fine solo individual zig-zag run to score under the posts. The same player then kicked the conversion before the Panthers suddenly found their stride. Chesterfield responded with a converted try to reduce the arrears to 12-7. With the referee playing an additional 14 minutes of injury time, Boston managed to keep play in the Chesterfield half to run down the clock and seal the win. Boston’s next match is at Grimsby on February 21 (KO 2.15pm). BOSTON: Buckberry, Dowse, Scupham, Dean, Eldin, Noble, Thompson, Kemp, Jonker, Halliday, Baldwin, J. Brooks, Neal, Chapman, Stansfield; Replacements: Johnson, Deamer, T. Brooks.